My Grandfather is now a Sergeant, so it must be later on in the war. My final Special Brigade photo in this location; but why, where and when were these photos taken ? My Grandfather (Sergeant) is 4th from the right (seated) on this Special Brigade photo. Any comments on this photo ? I've a few more photos somewhere, which may be of interest. I've also some scans which I could post on here of the list of members of the Northern Section of the Special Brigade in 1932 ? 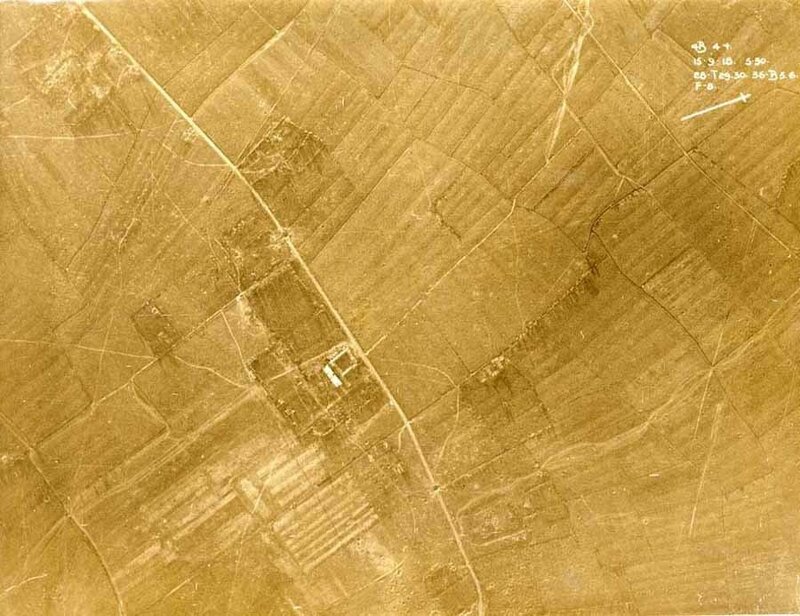 I've also got some aerial photos which I could post if anyone is interested, but how/why my Grandfather had them I really don't know - they each have the time and date of when they were taken detailed on the front and a very brief description of where on the back. Can anyone tell me anything about the photos I've posted; I'd be delighted if anyone could make a positive identification - particularly of a relative. If anyone can provide information, or should anyone like higher quality copies of these images via email, don't hesitate to contact me. Nice pics, Andy - do you know which Company it is ? Sadly, I don't know the company - I was hoping someone else might ! My Grandfather John S Heaton was an original member of the Special Brigade (I think in 188) and went right through the war with them. We always were aware that he was in the Special Brigade, but my Grandfather had the Mons Star - which occurred before the formation of the Special Brigade. Unfortunately, we don't know which regiment he was in prior to the Special Brigade. Does anyone know if I could find this out ? Annoyingly, I never wrote down all that he told us and we had every opportunity, since he lived until the very end of 1985. Thank you for taking the trouble to post a comment. Looks like he entered France in August 1915. So, assuming this is your man (the only John S Heaton I've found in the RE), he would have had the 1914 / 15 Star rather than the 1914 Star. Interests:Generals of the Great War. Yet another Special Brigade photo . . . .
No help I am afraid but just a comment on the way they are wearing the revolvers, sort of slung above the .303 ammo pouch (seen in 145 and 146 posts). I have never seen this worn like this. Was this a common occurrence for other ranks to wear the revolver holster like this? I assume they are carrying revolvers as well as rifles due to the duties of their job. However this seems a little strange they would all be issued rifles and revolvers. Did this continue throughout the war for members of the RE special Brigade? Many thanks indeed for your reply and for finding the details on Ancestry.com. I'm sure that you'll be correct ! When I get home, I'll check the medals - I expect to find a 1914 / 15 Star. Since you seem to 'know your stuff', I'd like to 'pick your brains' if I may ? I'd be interested to know what the details on the medal card mean . . . . . . .In the Remarks section it says ' CL:2 ' do you or anyone else know what that means ? In the Victory medal section there is a cross (as there is in the section next to Sgt) it says RE/101 and either H58 or A58 ? In the Star section it says RE/4B do they mean anything significant ? Thank you very much again, I know now that my Grandfather's number was 106528. There are forum members who know an awful lot about Medal Index Cards (and certainly far more than me!). However, as I understand it, 'CL: Z' stands for the category John was discharged under (presumably in 1919 sometime) 'Class Z' being the category in which a man had to return to the forces if Germany hadn't accepted the terms of the armistice. There are separate 'medal rolls' for the 1914, 1914/15 and British War Medal / Victory Medals. RE/4B 2498 is the medal roll and page number for John's 1914/15 Star medal. Generally speaking the entries written in red on his MIC are taken from the information on this medal roll (including that he was a Corporal when he entered France on 17th August 1915). The BWM/VM roll and page number (RE/101 B58 12329) - collated later than the 1914/15 Star medal roll and written in blue on the MIC, indicates a promotion to Sergeant at somepoint after he landed in France. I would guess from his MIC that John's 1914/15 Star will be to Corporal (Cpl) and his BWM and VM to Sergeant (Sgt). The medal rolls are housed at the National Archive (not searchable online I'm afraid). Many thanks for such a detailed reply - I could hardly have hoped to have gained so much information ! I've actually learned something today ! You've been a great help in clearing up a few issues that were puzzling us. Thank you ! I'm fairly sure that my Grandfather was in 188 Company, but I'm not sure which company he was in afterwards. I've got a list of the members of the Northern Section of the Special Brigade in 1932; my Grandfather's name is listed, but not his company - but he is not the only one to have the Company details omitted. I do know that he is quoted in Chemical Soldiers by Donald Richter - my father has a copy, so I'll check to see if it gives his company details. IF I can find which company my Grandfather was in, then I'll be closer to finding out a bit more about the photos that I've posted. Regarding Chemical Soldiers by Donald Richter, the author quotes a number of the soldiers; did he interview them personally, or did he get his information from the Special Brigade Newsletter ? I'm finding this forum to be very interesting and quite addictive ! I have a copy of Chemical Soldiers myself - I'll see if I can track down your grandfather's quote for you this evening. It would be great if Terry could provide any information relating to either my Grandfather or the photographs. Are you out there Terry ??? I notice that my Grandfather's regimental number (106528) certainly 'ties in' with others that I've seen on this forum. I'll be posting some aerial photos tonight - I hope that forum members find them interesting. Perhaps someone might be able to provide some information about them. I'm still baffled as to why my Grandfather had these photos. Thanks for posting the photo's , much appreciated. Your grandfather's number is one of those issued to the original specials and therefore 188 Company would be about right. He probably enlisted in July of 1915. 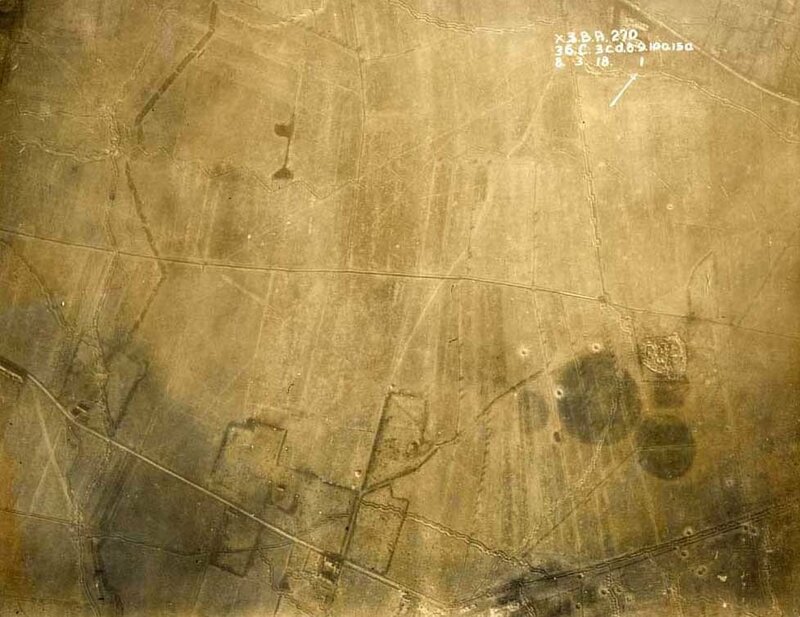 The photograph in post 148 was taken in 1916 or later. With the expansion of the Special Companies in to the Special Brigade, it was decided that the rank of Corporal was no longer to be allocated automatically. Most men entering the SB from early 1916 were given the rank of Pioneer. 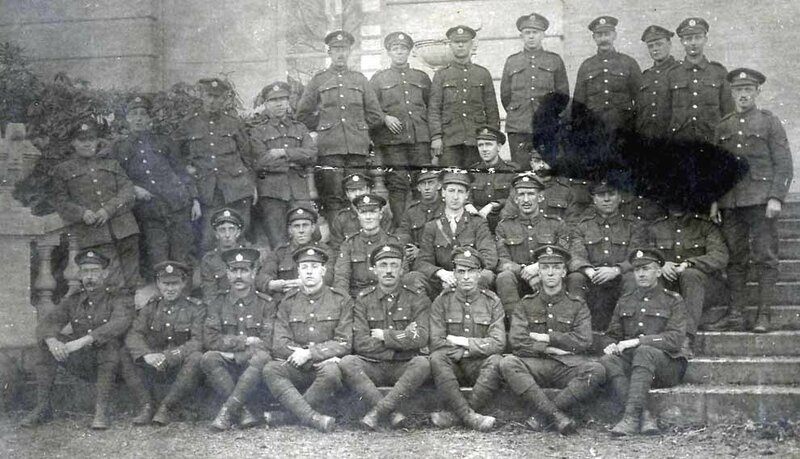 Post No 150, is almost certainly a section photograph - a Royal Engineers section being the equivalent of an infantry platoon. If somebody can identify the Scottish officers regiment, I should be able narrow down who the man is and may be able to identify which company he was with. There are two possible reasons for him being there 1. He was temporarily attached perhaps because he was to become a Gas Officer, a training and advisory appointment at a number of formation levels. 2. He was permanently attached to the SB, but preferred to stay with his own regiment rather transfer to the RE, which happened in a number of cases, which incidentally, included a Boer War VC recipient. 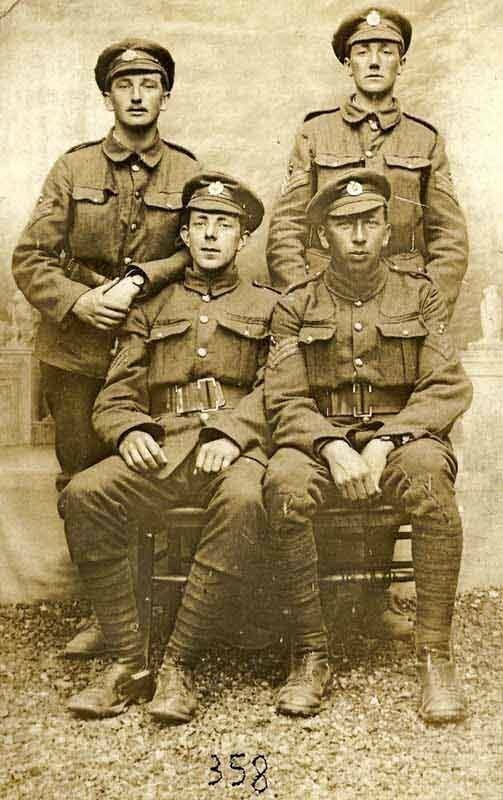 If he was in 188 Company, it may be that he ended up in one of the lettered companies of 3rd Battalion from 1916, although it is by no means definite. The best hope at the moment is to track down the scotsman. Many thanks indeed for posting such an interesting message. I've just found out that after 188, my Grandfather went on to be in L Company - according to Chemical Soldiers by Donald Richter. Is there any way in which I could find out any more about L Company ? I now intend to test your patience further, by posting some pictures which belonged to my Grandfather. I now know that he was in L Company Special Brigade, but how and why did he come by these photos ? Where given, I'll put the time & date of the photos and where they were taken. Should anyone want better quality copies of my images, don't hesitate to get in touch. This image was taken on 20/09/18 at 8.30am. 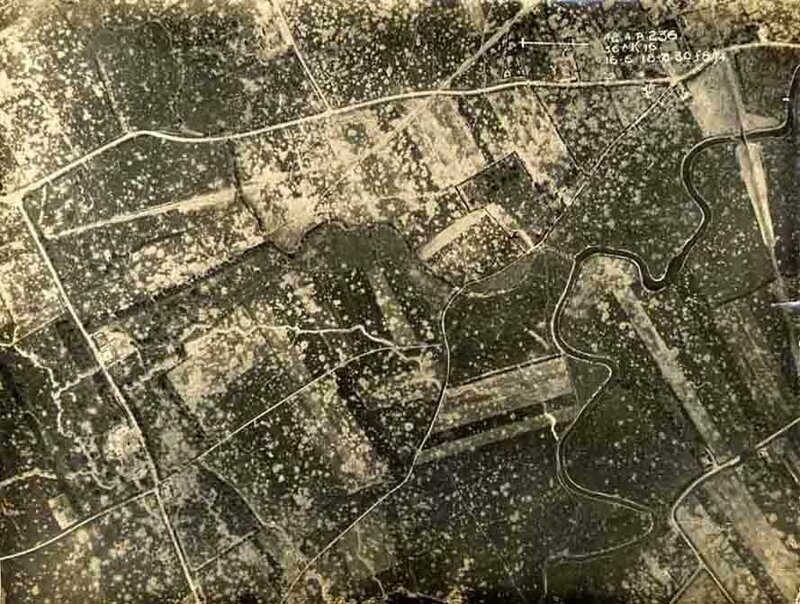 Look at the shell holes on this photo ! This photo states on the front : 17.5.18.3 Is that 3am on 17/05/18 ? 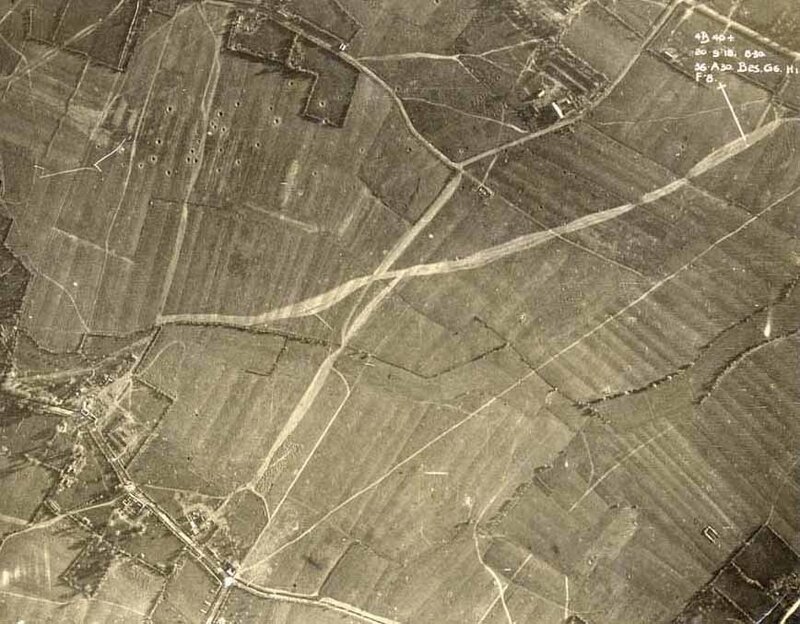 The road in the top right corner to the centre of the edge is to 'Vieux Berquin' . . . I think ! It also says on the back . . . 'Strageele' or perhaps 'Strazeele' ??? This area must have suffered horrifically !!! Any comments/information on any of these pictures most gratefully received. I've quite a few more photos, but I've monopolised this site enough for the time being !!! 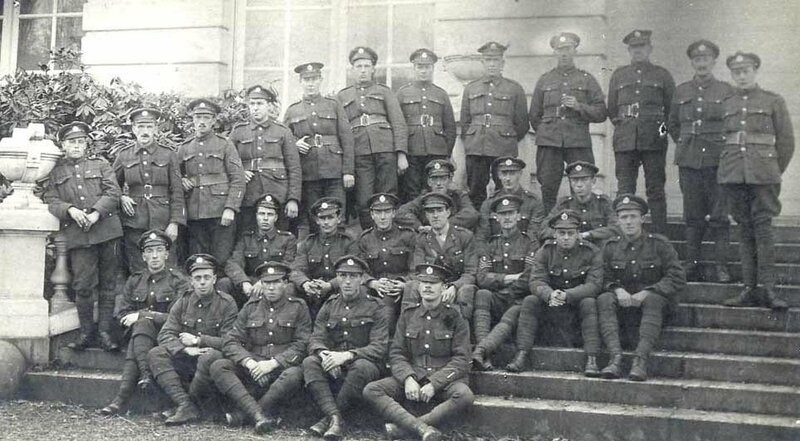 WO 95/334	`L' Special Company Royal Engineers	1917 Mar. - 1919 Mar. You may not be aware of it, but the Special's founding officer, CH Foulkes, was a keen photographer. I just wonder if he took some or all of these? WO 95/334 `L' Special Company Royal Engineers 1917 Mar. - 1919 Mar. Is it possible to acquire/order copies of either the Special Brigade Newsletter or L Company's War Diary ? I wasn't aware that CH Foulkes was a photographer; they are not the usual 'studio' type photos, so it is possible that he could have taken them. I notice that all the (earlier) photos with my Grandfather on say 'Carte Postale' on the back, the later ones don't say this. I am struck by your grandfather's number, Andy, 106528, as my grandfather's number was 106515 - only 13 apart (if that is meaningful). I also note Terry's comment about your one, "Your grandfather's number is one of those issued to the original specials and therefore 188 Company would be about right. He probably enlisted in July of 1915." Terry - does my granddad thus, with 106515, fall into this category of "original specials" ? I know he entered France 17 August 1915, but do not have an enlistment date. I do not know if he went straight to M Special Company or whether he was with any of the numbered companies first. Yet another Special Brigade photo - a later one, because my Grandfather is now Sergeant. Could this be a studio shot ? It looks as if there is a backcloth behind them ? 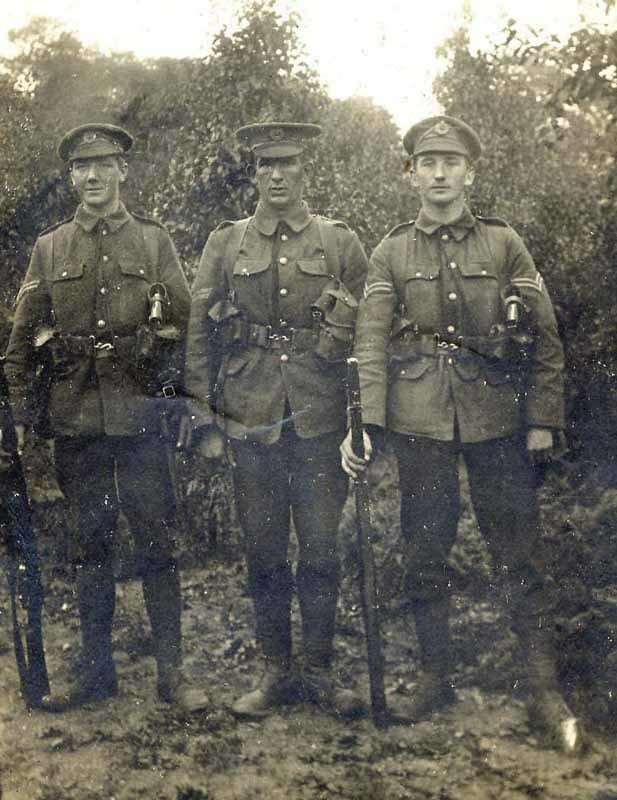 I notice that the soldier standing on the left has a wristwatch; my grandfather also had a wristwatch (which we still own) that he said was 'borrowed' by a General (Or a very senior officer) and used to time the start of the Battle of Loos. 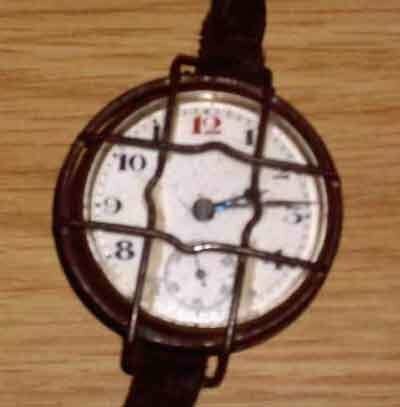 It was this watch . . . I remember my Grandfather mentioning that before he left for France, he was stationed at Chatham and that on one or more occasions, they slept in the dungeons at Dover Castle. I know very little about all this, but on my Grandfather's medal index card, it states that he entered France on 17th August, 1915 - as was the case with your Grandfather. My Grandfather went from 188 into 'L' Company; it is difficult to see how the situation could have differed for your own Grandfather ? 7. Others with no descriptions. According to the nots kept by my father, George Oswald Mitchell (G.O.M. ), who was a Sergeant in 'M' Special Company RE, he took part in gas assaults at La Becque, near Vieux Berquin, on 27 June and 24 July 1918. 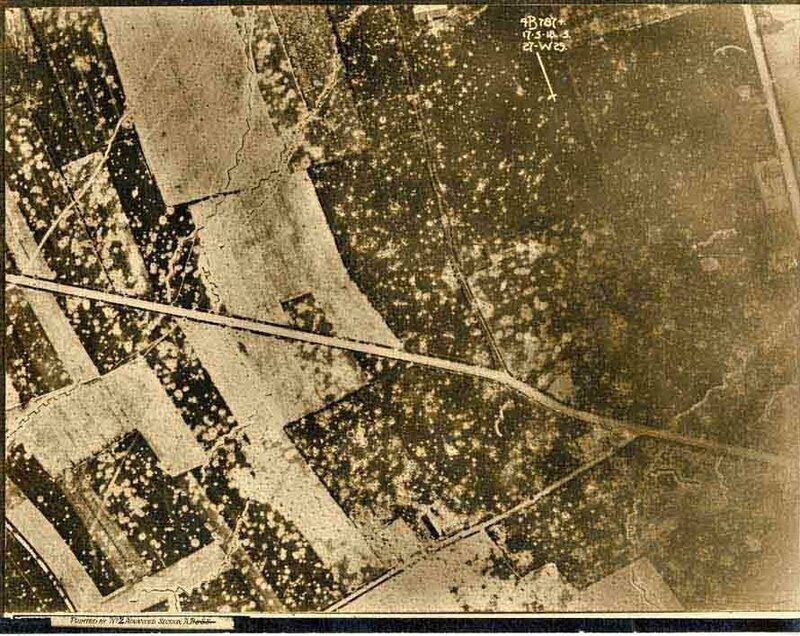 This was one of the most westerly points reached by the German spring 1918 assault in the British sector between Ypres and Bethune (see map on p.xii of Shrapnel and Whizzbangs).